Aluminum and steel Truck Decks are what we have to offer for you. Both featuring LED lights, solid construction and installation available, you'll be happy with the end product. We can also order them for just a half ton, all the way up to semi trailers as well. Our service department has a quick turnaround and will ensure that your deck is installed properly and safely. 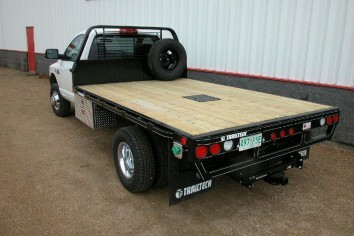 "We carry truck decks in the steel and aluminum options. We carry Trailtech Steel Decks and Aluma Aluminum Decks. Lightweight, aluminum truck beds and flatbeds for pickup trucks are available from Aluma! Multiple sizes and standard features provide a custom truck bed with a wide range of uses. Aluma Truck Decks come standard with the following, extruded aluminum floor with drop rear skirt, headache rack with lights, 3" channel main stringers which are adjustable to fit different truck models, LED light package, license plate light, pre-wired with lights installed, back-up lights, and ¼" x 2" rub rail with stake pockets. All decks come pre-wired and ready for installation. The Trailtech Truck Deck comes standard with a formed tubing headache rack, complete with rear window protection and a recessed gooseneck hitch plate. Every Plate has two Gooseneck Ball placements, and two locations to hook safety chains. All truck decks are offered with treated wood decking, stake pockets with rub rails and rubber mounted and recessed lighting. The tubing mainframe and cross members are standard construction for all decks, and channel sills underneath allow the deck to mount to your cab and chassis easily. The 4" x 2" formed Headache Rack provides both protection to the cab and the most usable deck possible. The design of the rear bumper allows the rubber recessed lighting to be placed into structural tubing protecting all wiring and connection from the elements, giving the owner years of trouble free lighting. Every Deck is built with a Rub Rail and Stake Pocket combination on each side. This Rub Rail acts as protection for the side when loading with equipment, or when using ramps. The Stake Pockets used are true DOT Rated Securement Points for tying your load down, and these same pockets can be used to accommodate picket sides. These decks are sturdy, well built and able to turn your truck into a real work truck. We offer various options which allow you to customize any truck deck to tailor your specific needs, such as tool/storage boxes, fuel/storage/water tanks, etc. "